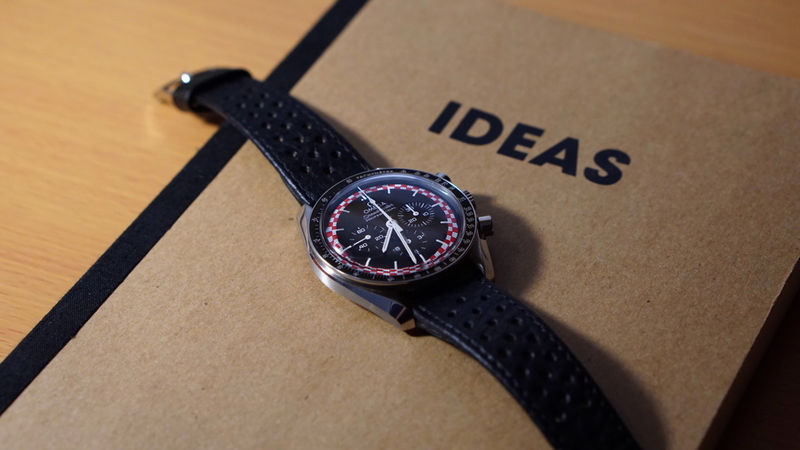 The story of Omega’s Speedmaster “Tintin” is the tale of a watch that almost never was. The same goes for Nathan and his red-and-white chequered dial Speedy. I have always found the most interesting watches to be unique variations of classic designs. The Tintin fits this description perfectly, and from the moment I saw it online, I knew I would eventually own one. It was actually a few years after it had been revealed that I decided to do a bit more research. 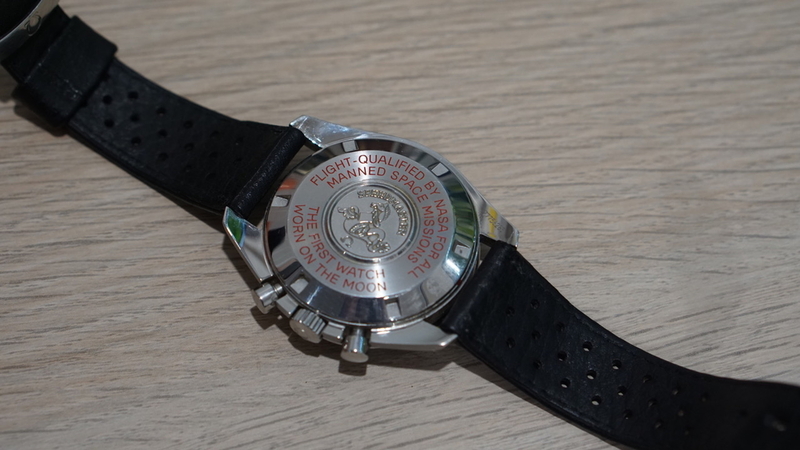 What I uncovered was the most intriguing story about a failed partnership and a half-complete watch, one that should have never really come to market. There was quite a bit of drama surrounding the purchase! When I first saw this Tintin for sale in Brisbane I hesitated and unfortunately someone in Sydney bought it before me. However, a few months later I saw another for sale in Sydney and I made sure I wasn’t going to let it get away from me. When I got hold of the watch, it became clear that this Tintin was the same one that had been taken to Sydney a few months earlier. It was meant to be! The Tintin had always stood out to me and I was convinced I was going to buy it before I had even seen it. However, when it was first in my hands it was so much better than any photo or video depiction. This has been a common reaction for people who may have previously disregarded the watch. When you get up close to the red-and-white chequered ring, it is clear there are small flaws with the painted minute segments. There is a smattering of slightly imperfect rectangles that result in odd overlapping and gaps. However, this is by far my most loved element of the Tintin, because it proves a perfect watch is capable of having imperfections. This watch has joined me on a number of adventures. On one end of the scale, I have taken the watch to rough locations, with a lightweight NATO strap keeping it company. On the other hand, the Tintin has joined me at many formal occasions on the black leather racing strap I had made for it (which I think looks the best). The great thing I have discovered with the Tintin is that it can be worn in any situation. This seems like such an underrated aspect of the watch, but it simply never feels out of place. It has never felt boring, or casual or too dressy. For me, it seems to be the ‘just right’ watch. Perhaps that is just because people are too busy admiring it to care about the social setting. Another great characteristic of the Tintin is that it has the iconic Speedmaster shape, size and weight that most ‘watch-people’ know and love. 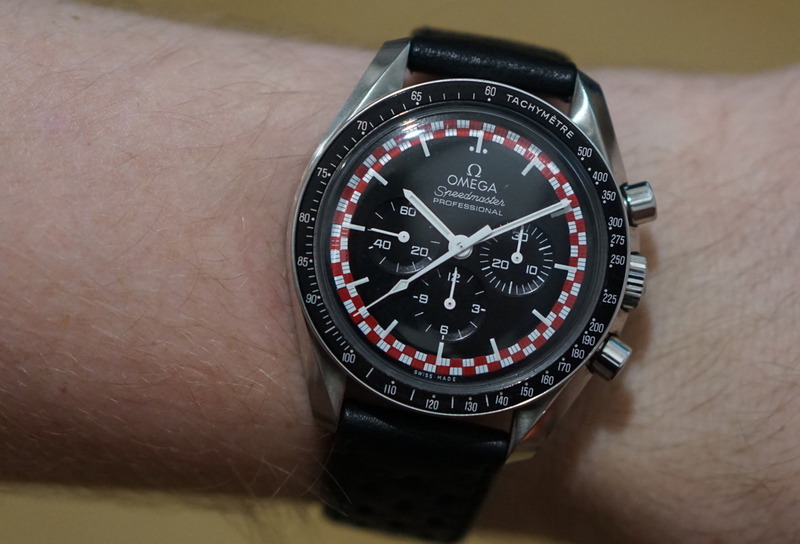 This, in my opinion, adds to the desirability of the watch because the only differences from the standard Hesalite Speedmaster Professional are cosmetic. Finally, this watch with its bright red-and-white dial is instantly recognisable. From across a room, people have seen it and come over to take a look. I was even at the dentist one time and it was noticed straight away, not as a Tintin, but as a very special Speedmaster. That’s the best part for me, there is no limited-edition marketing or luxurious box with the Tintin. 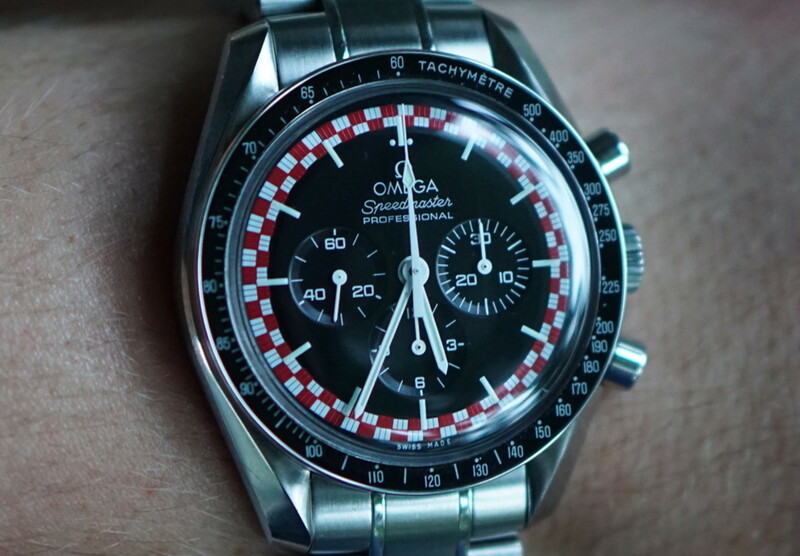 It’s just a Speedmaster, like all the others, that simply felt like being a bit different.